In Hitler's Ethic Weikart helps unlock the mystery of Hitler's evil by vividly demonstrating the surprising conclusion that Hitler's immorality flowed from a coherent ethic. Hitler was inspired by evolutionary ethics to pursue the utopian project of biologically improving the human race. Hitler's evolutionary ethic underlay or influenced almost every major feature of Nazi policy: eugenics (i.e., measures to improve human heredity, including compulsory sterilization), euthanasia, racism, population expansion, offensive warfare, and racial extermination. Hitler also believed that morality was biologically innate, so he thought that eliminating the "evil" Jews would bring moral progress. Richard Weikart is professor of modern European history at California State University, Stanislaus. He has lived in Germany over five years, including one year on a Fulbright Fellowship. He has published three previous books, including From Darwin to Hitler: Evolutionary Ethics, Eugenics, and Racism in Germany (2004), and his prize-winning dissertation, Socialist Darwinism: Evolution in German Socialist Thought from Marx to Bernstein (1999), as well as articles in German Studies Review, Journal of the History of Ideas, Isis, European Legacy, and History of European Ideas. For more information, see his professional vita. For information about speaking engagements, please contact him via e-mail (click here). There have been many attempts to provide the key to Hitler's world of ideas but Richard Weikart has succeeded in revealing what must be the central element in any understanding of Hitler's world view. The terrible paradox at the heart of the Third Reich, that biological utopia could only be created by intense physical suffering and violence, now has a proper explanation. What seemed to others bizarrely immoral appeared to Hitler an honorable duty. "Weikart's book is a respectable piece of research. In nine densely referenced chapters, he takes us through Hitler's guiding philosophy, based on a close reading of the Fuehrer's recorded utterances. The material examined is impressively comprehensive, ranging from the minor pieces of Hitler's early years, via the familiar core documents of Nazism, to the transcripts of secret addresses that have surfaced in recent years in Moscow (among the masses of material looted by the Russians after the war). Weikart knows his sources. What he says should therefore carry weight. He contends that Hitler's pronouncements amount to a coherent, if idiosyncratic ethical system, which guided the Nazi leader throughout his political and genocidal career. . . . If the two principal premises of Weikart's study then are familiar enough, his study still has merit. The merit lies in the way he has combined the two, and backed them up with a systematic trawl of the documents. The result is a persuasive image of Hitler's personal belief-system: a kind of secular religion, based on a cult of evolutionary progress. . . . There was, in other words, not just method in this murderous madness but moral purpose, albeit one that turned on its head the Christian precepts by which Europe had sought to live for centuries. This is an important finding." "With Hitler's Ethic, Richard Weikart has written an interesting sequel to his important earlier book, From Darwin to Hitler. . . . An 'evolutionary ethic,' as Weikart argues, may well have been an important component of Hitler's belief system, helping to unite--or at least rationalize--his rabid antisemitism and anti-Bolshevism with his desire for living space. That this ethos defined Nazi theory and practice to the exlusion of most other ideological and pragmatic factors is harder to accept. In turning our attention once again to the role of 'evolutionary progress' in Nazi thinking, Hitler's Ethic is nonethelss a stimulating work of intellectual history that deserves a wide audience." "The elements of Nazi ideology seem diverse--racism, German nationalism, anti-Semitism, socialism, militarism, imperialistic expansionism, the "leadership principle," eugenics, and genocide. But Weikart is remarkably persuasive in showing how all of these strands of Nazi ideology are woven together by the final end of Hitler's ethic--the evolutionary improvement of the human species through the triumph of the Aryan race in the struggle for existence. Proponents of Darwinian ethics--like myself--should be honest in recognizing the impressive evidence that Weikart marshalls from Hitler's writings and speeches to show how Hitler's thought and actions were driven by a coherent view of Darwinian ethics." "In this fascinating and readable book, Weikart suggests that Nazi dictator Adolf Hitler was not merely driven by a hunger for power as he ruthlessly sought to conquer neighboring countries and as he identified some people for an untimely death. 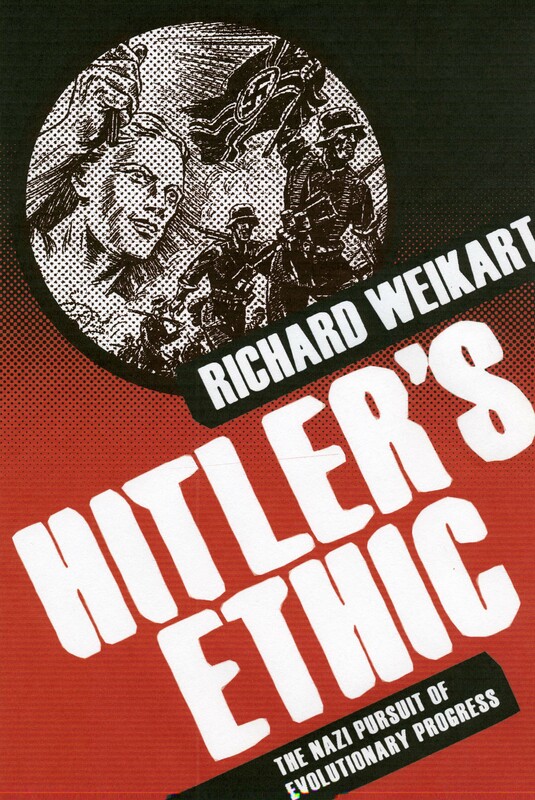 Rather, he argues convincingly that Hitler had a coherent ethic based upon his understanding of evolution which formed a foundation and rationale for his actions before and during his time as Fuhrer. . . . With so many publications on Hitler already in print, one can ask whether it was necessary for Weikart to add his theory to the mix. Given the author's clear writing style, well-supported assertions, and excellent research evidenced in Hitler's Ethic, this reviewer believes Weikart's book is, in fact, a valuable addition to the field of modern German intellectual history. . . . Fortunately, this book is accessible to both undergraduate and graduate students as well as to a broader reading audience." "In his well-researched and fascinating book Hitler's Ethic, Richard Weikart tackles the common misunderstanding of Hitler's amorality." "Richard Weikart's outstanding book shows in sober and convincing detail how Darwinist thinkers in Germany had developed an amoral attitude to human society by the time of the First World War, in which the supposed good of the race was applied as the sole criterion of public policy and 'racial hygiene'. Without over-simplifying the lines that connected this body of thought to Hitler, he demonstrates with chilling clarity how policies such as infanticide, assisted suicide, marriage prohibitions and much else were being proposed for those considered racially or eugenically inferior by a variety of Darwinist writers and scientists, providing Hitler and the Nazis with a scientific justification for the policies they pursued once they came to power." "This book will prove to be an invaluable source for anyone wondering how closely linked Social Darwinism and Nazi ideologies, especially as uttered by Hitler, really were." Hitler's Ethic can be ordered in hardcover and pre-ordered in paperback at amazon.com and BarnesandNoble.com. The best price I know for the hardback currently is at www.hebookservice.com. It is also available directly from the publisher or can be ordered by other booksellers.